John Clayton Mayer is an American pop and blues rock musician, singer-songwriter, recording artist, and music producer. Born in Bridgeport, Connecticut, and raised in Fairfield, he attended Berklee College of Music in Boston. John Mayer's guitar tones can be closely emulated by plugging a Fender Stratocaster guitar into a Dumble or Fender style amp, and shaping the sound using the pedals found on this Equipment Board. We have tried to include the most notable guitars and amps John Mayer has used live and in his studio, but it has been documented that his guitar collection is over 200 guitars strong. What kind of Guitars does John Mayer use? Click here to let us know! “Paul and I worked very closely to create this guitar, and the result is an incredibly refined and elegant instrument. It has a completely new sound and spirit. It's been a joy to play and I'm excited to share that experience with other guitar players” - John Mayer. "This guitar is not a masterbuilt, it's not a custom shop. This is one that would absolutely have been sent to a store if I didn't take it. I'm using it live on three or four songs, and I'm loving it. It has the absolute heart and soul of the BLACK1, but if you're playing in your own band and you're trying to make a name for yourself, I think it's really cool to have a guitar that is sort of a blank canvas for someone to make a name for themselves with or a sound for themselves on. I think this is one of the classiest strats I've even seen. Piano black. Gold hardware. Mint pickguard. Mother of pearl tuners. It's like, I want to plug this thing in." "The idea is to have a guitar that is smaller, that you can take it on a bus, you can take it on vacation, you could take it anywhere you wanted to go, but that when you opened the case you would have a beautiful, perfect, ornate guitar that you don't really see anymore. A Martin 0045 is still one of the rarest model Martins, even when you consider reissues and special editions. It doesn't really end up in a lot of people's hands. I've thought of it as a guitar that has been overlooked for years. The neck is true to speck as a 0045 neck can get - the whole guitar is of the period! The thing about it that I think is the standout is this idea to continue the abalone inlay. The fret board always covers up the inlay underneath it, but what if the inlay kept going? You know, it's the Martin spirit to see if it can be done by doing it - I think it meets up perfectly. And that's done by hand. It almost gives the effect as if it's glowing underneath the neck; as if it's really, really bright but the neck is covering it. Everything about it, it's just a detail that from a mile away you would know it's that guitar. So it's a love letter to the period; it's a love letter to and from Martin, and it's a love letter to and from me to guitar collectors, guitar enthusiasts, and also enthusiasts of thing of this day and age that still resonate with great design and resonate with being ornate and being valuable. We're artisans. Martin is a custom shop - they're artisans. This guitar is a real treat and a blessing to own. I'm lucky to have one. The best compliment in the world is, if someone doesn't really own one of my records, or maybe heard a couple of my songs, or doesn't really an opinion one way or the other about what I do, but sees a guitar that I've helped design and they love it without having anything to do with me - that's the ultimate complement," says acclaimed guitarist and singer John Mayer about the Martin 0045SC John Mayer Stagecoach Edition Acoustic Guitar. John Mayer collaborated with Fender on his Signature Stratocaster. John used this guitar for the recording of “War of My Life” and “Assassin” on the Battle Studies album. In the video, he plays it for a live performance of "War of My Life". John uses this guitar for a performance of "Neon" at his "Any Given Thursday" concert. At the very beginning of the video, on the screen is a photo of John playing what looks like a Gibson L7N. This video shows John on the 594. 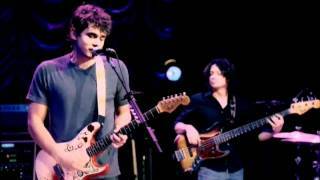 John Mayer performing JJ Cale's "Call Me The Breeze", a cover track off Mayer's album "Paradise Valley" at the PNC Bank Arts Center in Holmdel, NJ on Wednesday, August 21, 2013. He is accompanied by legendary guitarist Robby Krieger of The Doors. John Mayer can be seen using this guitar at 5:50. John posted a picture on his instagram, signing labels for this signature guitar. After graduating high school, John Mayer worked at a gas station for over a year to earn enough cash to buy a 1996 Stevie Ray Vaughan signature Stratocaster. “…this one I bought with the money that I had made working at a gas station. I traded in a Takamine 12-string and a Mesa Boogie distortion pedal. I think I paid like nine hundred bucks as the difference. So I bough this in 1996. This thing has so many little stories on it. [points to the bridge] This was replaced, I remember the day I had to order a replacement - I was in Atlanta in like 1998… 1999 maybe. I had a replacement put in there because I broke the whammy bar off in here. [John Mayer points to the tip of the headstock] I got that from hitting drums cymbals with it. I thought it was really cool to hit drum cymbals. … I took this backplate to the mall in 1997, and it says John Mayer 1997 before I went to Berkeley. [Mayer points to the ‘JCM’ engraving on the lower half of the back of the Strat] I did that with the engraving gun at the Berkeley dorms.  JCM. [Mayer points to the back mid-point of the neck] And then this is from sanding it down - and playing - but mostly sanding it down with 400 grit sandpaper. 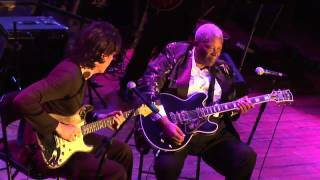 In this video John Mayer is seen using his Fender Jimi Hendrix Monterey Pop Stratocaster during his sold-out performance "Where the Light Is", live at the Nokia Center in L.A. He replaced the fretboard with a brazilian rosewood one, and sanded off its neck. A good close-up look at the guitar can be had around the 1:10 mark. 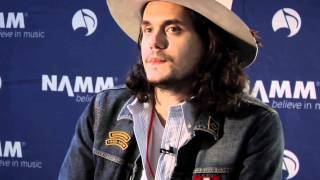 John Mayer was given one of the 185 replicas of Lenny, a guitar owned by Stevie Ray Vaughan. At around 1:01 you can see John holding the guitar, and at 1:27 you can see him playing it. You can also see legendary guitar tech, Rene Martinez (who used to work for Stevie) setting up the guitar at around the 2:31-time stamp. The Martin OMJM John Mayer is one of Mayer's signature guitars from Martin. The customized Fender John Mayer "The Black One" Stratocaster relic has been spotted in use by guitarist John Mayer himself in numerous performances, including this one with B.B. King. 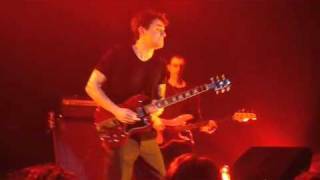 John Mayer can be seen playing a Gibson L-5 Electric Guitar starting at 0:28 of this video. This specific Gibson custom that John Mayer owns comes in an all natural light wood color. John Mayer is seen using the dark red Gibson SG Standard Electric Guitar while he rocks a sold-out audience at the Copley Hall in San Diego. John Mayer can be seen fingerpicking the Mike Campbell Signature Dusenberg in his 2010 appearance on CMT Crossroads with Keith Urban. John Mayer live, playing a black Duesenberg Double Cat guitar. John Mayer uses this Eric Clapton Signature Martin ECHF Belleza Nera in ''Half of my Heart'' and ''Who says" acoustic version in Tokyo. John Mayes uses a Martin D-45 in "Where The Light Is" to play the song ''In Your Atmosphere''. The Fender Cabronita is used by John Mayer for the performing of ''Perfectly Lonely''. John Mayer used this Martin OM-42 at the Grammys. This Stratocaster with a golden top is exclusively used for the performance of ''Vultures''. The Fender Artist Series Stevie Ray Vaughan Stratocaster is part of the extensive guitar collection that renowned musician John Mayer owns. Guitarist John Mayer uses the Fender Custom Shop Stevie Ray Vaughan Lenny Tribute Stratocaster. John Mayer's gear is on Equipboard.